Items removed from the house included baby carriages, a doll carriage, rusted bicycles, old food, potato peelers, a collection of guns, glass chandeliers, bowling balls, camera equipment, the folding top of a horse-drawn carriage, a sawhorse, three dressmaking dummies, painted portraits, pinup girl photos, plaster busts, Mrs. Collyer’s hope chests, rusty bed springs, the kerosene stove, a child’s chair (the brothers were lifelong bachelors and childless), more than 25,000 books (including thousands about medicine and engineering and more than 2,500 on law), human organs pickled in jars, eight live cats, the chassis of the old Model T with which Langley had been tinkering, tapestries, hundreds of yards of unused silks and fabric, clocks, 14 pianos (both grand and upright), a clavichord, two organs, banjos, violins, bugles, accordions, a gramophone and records, and countless bundles of newspapers and magazines, some of them decades old. Near the spot where Homer died, police also found 34 bank account passbooks, with a total of $3,007.18 (about $40,000 in 2008 dollars). The brothers shunned the outside world, which of course led to many wild rumors about “what they were doing in there,” hidden riches, etc. Children threw stones at the windows and there were several break-in attempts. By the early 1930s, Homer was crippled by rheumatism and had gone blind. Langley foraged for food throughout the city at night and brought it home for Homer. Their story, as you should expect, ends badly. Police entered the house on a tip that there was a dead body in the house. Well, they tried to enter. They ended up having to excavate their way into the house, working through various windows, throwing tons of materials into the streets so they could make their way into the place, until finally an officer found Homer sitting in a chair, slumped over, starved to death. Langley was nowhere to be found. 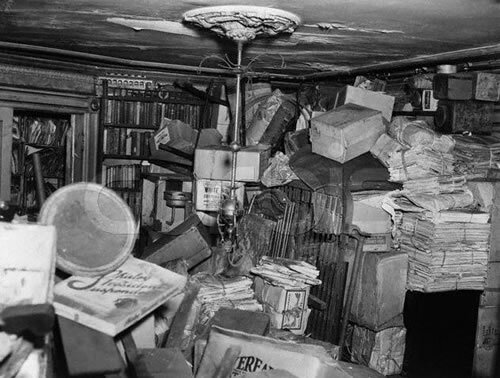 Rumors circulated about how Langley had done his brother in and there was an attempt at a national manhunt, but after a few more days of searching in the house, Langley’s body was found under a mountain of garbage and treasures. Apparently, Langley had constructed various tunnels through the house, rigged with booby traps to ward against intruders, and he accidentally tripped a wire while trying to bring food to Homer. Langley died first, and helpless Homer died days later. Doctorow’s novel is loosely rooted in the real story, but follows its own path. In the novel, the brothers are born a little later and survive into the 1970s, witnessing the transformations of the century: automobiles, gramophones, wars, beatniks, hippies, and so on. Homer goes blind early on, and then in later years goes deaf as well. Langley fights in WWI and is scarred by mustard gas and becomes embittered toward humanity. His life’s project is an eternal newspaper: convinced that nothing ever really changes except names and dates, he thinks he can assemble the perfect newspaper that captures each and every every day’s events throughout the rest of human time. In a sense, Homer is the reclusive brother – losing sight and then hearing, retreating ever inward into his own mind – and Langley is certainly the hoarder, gathering up all of the changing news and technology of the century into a single place where it can be somehow transformed into an unchanging present. It’s a haunting tale – both the novel and the fact. This entry was posted in Books, Historical episodes. Bookmark the permalink. The fear of the hoard is the beginning of wisdom.